In this book, His Holiness the Dalai Lama and Venerable Thubten Chodron map out the convergence and divergence of the two major Buddhist movements—the Sanskrit traditions of Tibet and East Asia and the Pāli traditions of Sri Lanka and Southeast Asia. The authors consider Buddhism’s core practices and tenets, such as the four noble truths, the practice of meditation, the cultivation of love, and the meaning of nirvāṇa, and how the traditions sometimes agree and sometimes differ in their interpretations. The authors’ respectful approach illuminates the many ways that all forms of Buddhism, amid their rich diversity, share a common heritage and common goals. The Story Behind "Buddhism: One Teacher, Many Traditions"
Venerable Chodron began a series of live teachings from Buddhism: One Teacher, Many Traditions at Sravasti Abbey in 2014. Wisdom Academy carefully edited videos from those teachings and created a well-structured, step-by-step online study program. Part I is available here. When we investigate Buddhism’s major traditions, as the present book does, we can see that they have contributed to the world a rich tapestry of cultural, social, and spiritual knowledge. That knowledge offers deep insights into psychology, philosophy, and mental health. The broad recognition of this has fed today’s global awakening to the importance of meditation. A book showing the commonalities and unique points of various Buddhist traditions could have been approached from any number of perspectives. As Buddhists, we all bow to the Buddha, make offerings, and confess our ethical downfalls. We engage in meditation, chanting, study and recitation of sūtras, and listening to teachings. All of our communities have temples, monasteries, hermitages, and centers. Explaining the similarities and differences among these external activities would certainly aid our mutual understanding. Not all people think alike. They have different needs, interests, and dispositions in almost every area of life, including religion. As a skillful teacher, the Buddha gave various teachings to correspond to the varieties of sentient beings. We’re going to look at the development of the two major Buddhist traditions containing these teachings, the Pāli and Sanskrit traditions. But first, we begin with the life story of Śākyamuni Buddha. Available in Bahasa Indonesia, Polish, Korean, French, Traditional Chinese, Spanish, Italian, Russian and Vietnamese. 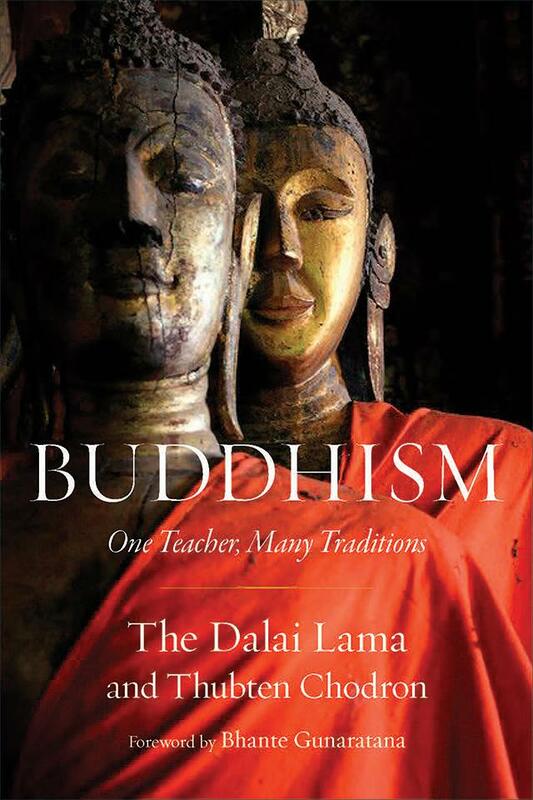 In this excellent primer on the essentials of Buddhism, His Holiness the Dalai Lama teams up with American-born Buddhist nun Thubten Chodron, founder and abbess of Sravasti Abbey, a monastery in Eastern Washington State. As the subtitle reveals, in this world religion, there is one teacher and many diverse traditions to savor. Reading this book we begin to sense how huge and diverse the Buddhist family is. A common bond which connects all Buddhist practitioners is their being messengers of peace. In 15 chapters from the opening one on “Origin and Spread of the Buddha’s Doctrine” to the closing one on “Tantra,” His Holiness the Dalai Lama and Thubten Chodron explain some of the more complex teachings on selflessness, emptiness, dependent arising, and the higher training in ethical conduct and wisdom. We appreciated the clear and cogent explanations of the four immeasurables (love, compassion, joy, and equanimity). Each of these virtues has a “near enemy” and a “far enemy” and the goal is to be free of both of them. After finishing “Buddhism: One Teacher, Many Traditions” you will have a deeper appreciation of this path.